Prime Minister David Cameron was quizzed about Magna Carta on the David Letterman Show. The document is considered by many to represent the foundation of democracy, but has its importance been exaggerated? Magna Carta - Latin for Great Charter - was agreed at Runnymede in 1215 and sealed by King John after powerful barons had rebelled and captured London. Held up as the embodiment of freedom and equality, it is revered in the US and credited with justifying the resistance to the rule of George III and influencing the Declaration of Independence. In his inaugural address in 1941, President Franklin D Roosevelt said: "The democratic aspiration is no mere recent phase in human history... It was written in Magna Carta." But Magna Carta's status isn't agreed upon by everyone. In his book, A History of Britain, the historian Simon Schama writes that Magna Carta is not the birth certificate of freedom but rather the death certificate of despotism. And Mark Juddery, author of Overrated: The 50 Most Overhyped Things in History, argues that the interpretation of the charter over the centuries as a call for freedom is not the reality of the original document. So what is Magna Carta? What were the events leading up to Magna Carta? "What Magna Carta now means is great, but it did not have such lofty ideals at all," he says. "It was great if you were a nobleman because it gave you the right to land. They really didn't like paying rent. "That was the main reason they formulated Magna Carta. It wasn't really a case of this feeling that there should be a lot more freedom and that everyone should be equal. "There was nothing about King John's numerous acts of cruelty and murder." Indeed, the majority of the clauses in the original document were focused on rights relating to the barons. And of the 63 clauses, only three have not now been repealed or become obsolete. The most famous of these is: "No free man shall be seized or imprisoned, or stripped of his rights or possessions, or outlawed or exiled. Nor will we proceed with force against him. Except by the lawful judgement of his equals or by the law of the land. To no one will we sell, to no one deny or delay right or justice." Despite that clause being the touchstone for countless causes related to liberty, it was afforded no real prominence and was buried deep in the document. "It's interesting that the key one which says 'no free man be seized or imprisoned' was not even for everybody," says Dr Claire Breay, who is lead curator of Medieval manuscripts at the British Library. "There were more freemen than barons but the majority of the population were the unfree peasantry, so the majority were not directly affected by Magna Carta in 1215." And Dr George Garnett, a history lecturer at Oxford University, specialising in English history in the 10-13th Centuries, says that while Magna Carta has proved to be enormously influential, that wasn't its original intention. "It was designed to be a quick fix in an impossible and unprecedented set of circumstances," he says. "The king was absolutely desperate and within six months he'd persuaded the pope to annul it. "But because he then died shortly afterwards, and because his son was a minor and remained a minor for about 10 years, the country was then ruled by a council of barons and they ensured that the suitably amended Magna Carta was reissued." It was reissued several times in the 13th Century, with the text changing from the 1215 original. 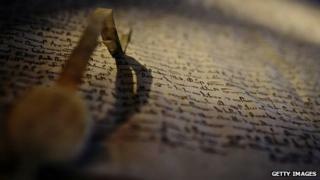 The version that became part of the first English statute in 1297 was the one signed by King Henry III in 1225. Breay says although the meaning of Magna Carta over the centuries has become different from its original purpose, it still represents a pivotal moment in British history. "Even all the other clauses taken as a totality - although a lot of them are about feudal right and privileges and redundant now - they were all establishing that the king wasn't above the law and that he had had to govern within the law. That's really important." Arrangements are already being made to celebrate the charter's 800th anniversary in 2015. Its reinterpretation over the centuries as a beacon for freedom, democracy and law has helped maintain its importance, Garnett says. "Even looked at it in the context of 1215, it is an extraordinarily clever bit of lawyerly work because in 1212, the most sophisticated thing the opposition could think of doing was deserting John on a campaign against the Welsh in the hope that the Welsh would kill him. "Magna Carta is a far more subtle and ingenious instrument for controlling a problematic king. It's really remarkable in the context of 1215 but it's how it's subsequently used and interpreted which makes it so important in the story of English liberties and American liberty."